Grace Hudson (American, 1865-1937). 'Hapa Haole.' Oil on canvas. The collection of Sam and Mary Cooke. Days of Grace: California Artist Grace Hudson in Hawai‘i features a selection of Grace Hudson’s rarely seen portraits and landscape paintings from her 1901 stay in Hawai‘i, along with items of Hawaiian material culture acquired by the artist during her visit. Best known for her portraits of the Pomo Native American people living near her Ukiah, California home, Hudson’s work in Hawai‘i maintained a figurative focus, depicting primarily Native Hawaiian and Asian women and children rendered with a preference for accuracy over improvisation. Her artistic approach, which veers away from the romantic and toward the ethnographic, was a consistent theme across her long career as a painter. Hudson is one of a small but important echelon of early twentieth-century female artists who traveled independently to Hawai‘i in bold fashion while honing their professional artistic careers. With Georgia O’Keeffe, Dorothy Thorpe, and Frederica Gordon-Cummings, and the resident female artists Helen Whitney Kelley, Juliette May Fraser, Madge Tennent, and Genevieve Springston Lynch, Hudson’s oeuvre exemplifies artwork informed by pre-war Hawai‘i. 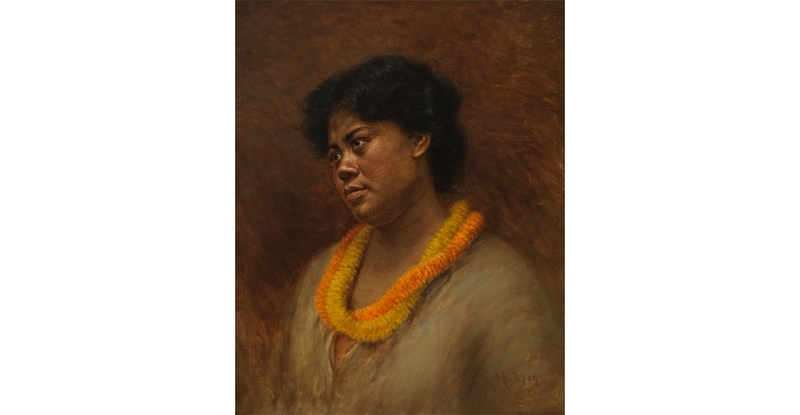 Many of the artists who exhibited with Hudson, and who contributed to Hawai‘i’s eclectic art scene, are featured in the exhibition Women Artists in Hawai‘i: 1900‒1950, on view in the museum’s Holt Gallery from September 3, 2015 to February 28, 2016. The exhibition is organized by the Grace Hudson Museum in Ukiah, California and was made possible by the Dolores Furtado Martin Foundation, Watters O. Martin, Jr., the Atherton Family Foundation, Ivy Richardson and the Sun House Guild. The Honolulu presentation is supported in part by the Dolores Furtado Martin Foundation.